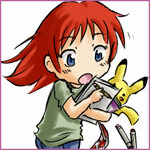 Today's drawing was requested by Momo. It's Hop celebrating New Years! Amusingly, this is after I asked her to draw Hop for Christmas. Should've done more with the background, but I'm tired. 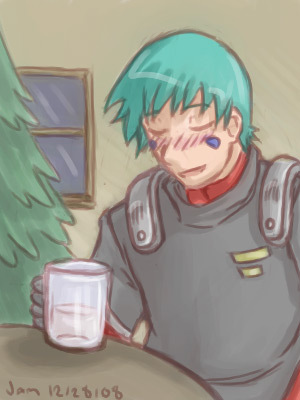 This time it's Rokai for Schala! Probably my last main entry for wintry clothes. Kinda simple, but Rokai is nice. 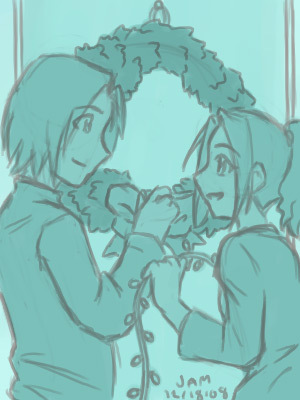 Sammich requested Sigma and Theta under mistletoe. Plink requested a drawing of O'Connell after the holiday with eggnog. Things are quieting down, too quiet. He looks like he's had a good night. 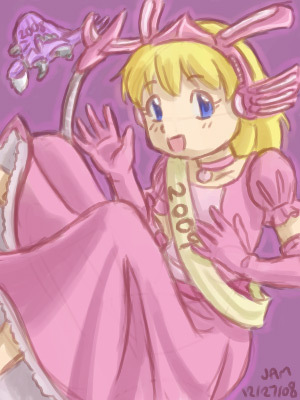 Rantinan suggested, "New years princess theme. A Gator or a liger with an hourglass for the whole father time look." It's a Blade Liger Princess, in pink, as Rant loooves pink! Couldn't fit in an hourglass, so Gator got a beard instead. 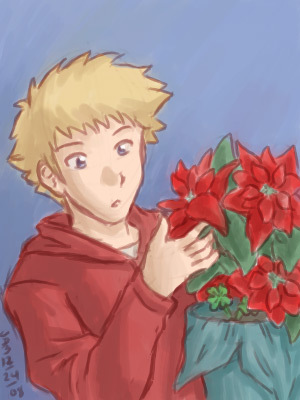 So, to fill up the rest of the month, I took some requests from friends for some more holiday art. That being said, here's the first one, requested by Tilly. 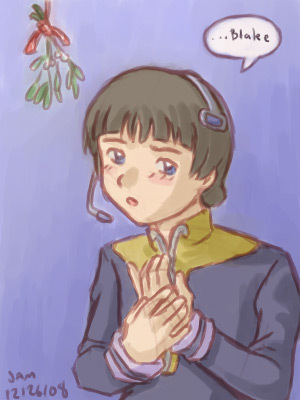 It's Luke (with mistletoe) from Zoids Fuzors! He's so cute. This is so cheesy. I'll make it up with Allstar sometime, Tilly. Sorry, this is all I have for today. 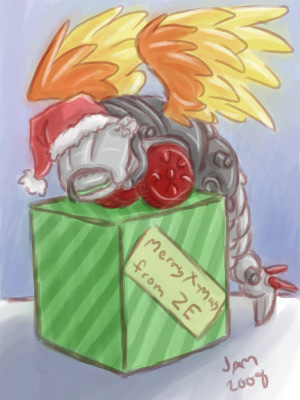 It's just a little holiday picture that I made for Zoids Evolution. The forum's "mascot" is a Molga Zoid with phoenix wings. It looks pretty joyful for a caterpillar war machine. 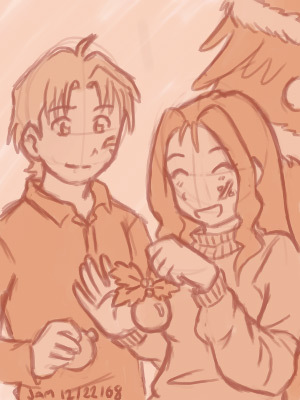 I was gonna do this later, but decided I wouldn't have time to get it all done when I wanted tomorrow, so here's my entry for the 24th, the last day of the Advent Calendar. Whoever brainstormed the calendar ran out of Christmas themes for these past two days. I thought the mushroom was bad, but the 24th gave me... a four leaf clover. Well... a challenge is a challenge! This is Sammich's character Gavriel (I love him! ), discovering some lucky weeds in a poinsettia pot. 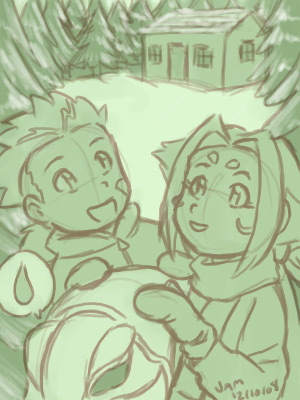 The holiday pics will continue for the rest of the month, but the Advent is done! Today's chocolate had a spotted mushroom on it. I'm really not sure what that has to do with Christmas, but I worked with it! This is Sammich's character Elbee. She turned out pretty cute. 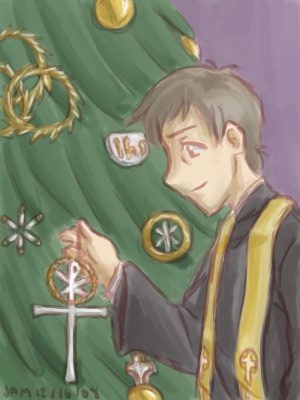 Only one more Advent drawing to go! December 21st was an ornament with holly. Schala mentioned Auszug, an old Zoids OC of mine, so I drew him along with her Zoids OC Amalthea. They look pretty sweet together decorating a tree. 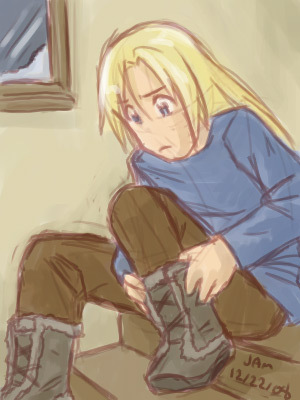 Today's theme was... a winter boot. Huh? Sammich suggested her character Auberon. He's a cutie. I want some boots like that to keep my feet warm! 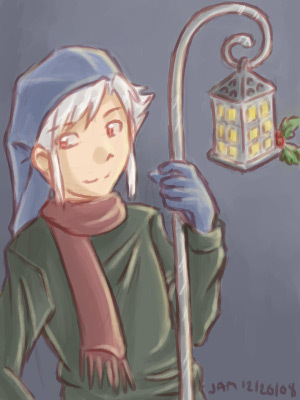 Yesterday's theme was a lantern with holly. I asked Schala for a suggestion for a character (without telling the theme), and she told me to draw Azazel, one of Sammich's characters. Today's was a star, and Sammich suggested Rayen. I've already drawn her husband and her father for this, so why not? I think I'm enjoying drawing winter gear. They became gumdrops. Hazel seems to think they're tasty! Today's was a nice easy wreath with Ian and Georgia. 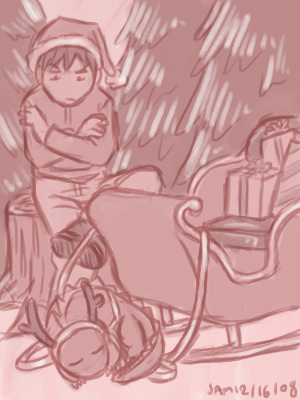 December 15th had a chocolate with a sleigh with gifts in it... and I had a similar idea to this a year or so ago, but never got around to it... so here's a simple version. Tokyozilla does NOT make a good reindeer. 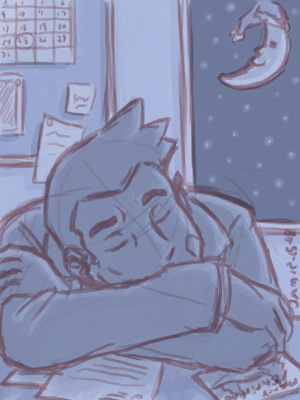 Detective Gumshoe's had a long night. I'll try to catch up with the 15th and 16th tomorrow. The 13th gave me a chocolate with a cute deer on it. So here's Michiro Ueyama's girl version of Zeke/Sieg with a cute deer. I should do a good drawing of her some day. I'm a sucker for cute sometimes. Nothing yet for the actual 14th. I'm still puzzling on what to do. The chocolate for December 11th was a candle with holly on it. 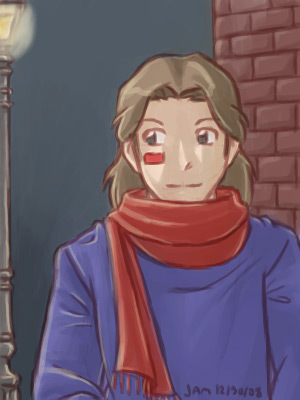 For some reason Sammich's character Christof came to mind. 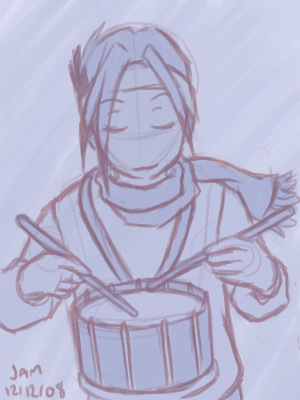 Today's chocolate was a drum, so here's my character Ripley, who is... a drummer. 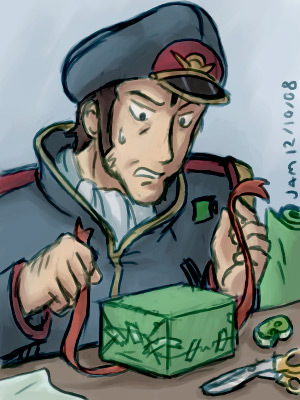 December 9th was a gift box, so here's Lieutenant Yamamoto from "Irresponsible Captain Tylor" hopelessly trying to wrap a gift. Today's Advent chocolate had a snow covered cabin by a pine tree. I should've spent more time on it. 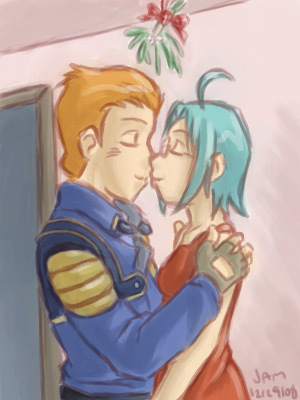 Van and Fiona seem pleased though. Sorry again for a late entry, but I was completely exhausted last night. For the 7th, I got a chocolate with a steam engine on it. 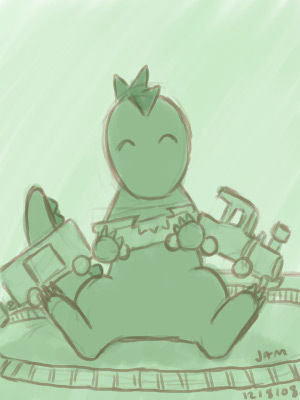 So here's Tokyozilla enjoying a traditional Christmas toy in his own delightful way! 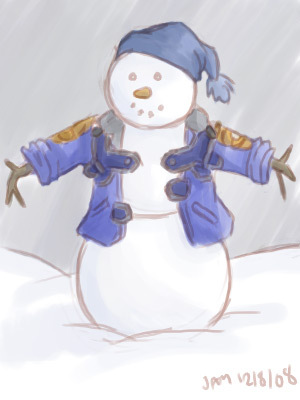 Next for today was a snowman, which is kinda boring. So I dressed it up in a Mach Storm jacket! I wonder which member will find his jacket soaking wet with snow later? Got a bit behind, so here's today and yesterday. For December 5th, the Advent Calendar gave me a squirrel... I couldn't think of any squirrel things, so instead here's an alien rodent thing helping Tag's Galaxy Police decorate their tree. Emu doesn't seem impressed. The critter's owner is though. They need names. Help? For today I got a bell. I also noticed on my pocket calendar that today is the creation date for my character Joel. 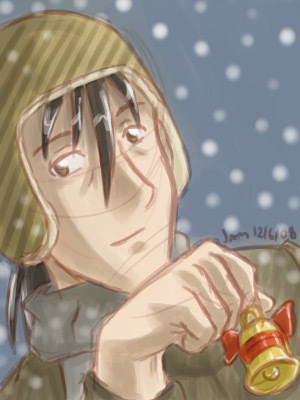 So here's Joel with a bell, all dressed for winter. Sorry this is kinda late. It's my entry for yesterday. 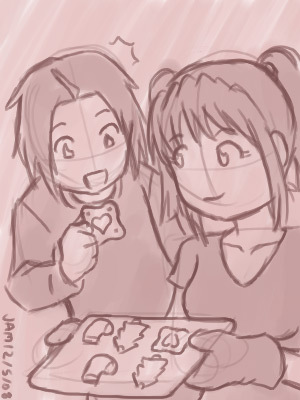 It's Klefaw and Cherise making holiday cookies! Or Cherise baking and Klefaw wanting to eat them all. The chocolate I got was that odd shape with the heart in it. Works for a cookie shape I guess. Today's chocolate was a teddy bear. 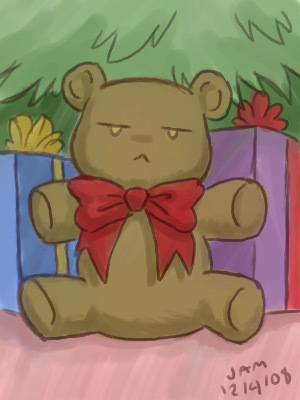 So here you get Tamaki Suoh's teddy bear from "Ouran High School Host Club". I was actually kinda hoping I'd get to draw it. 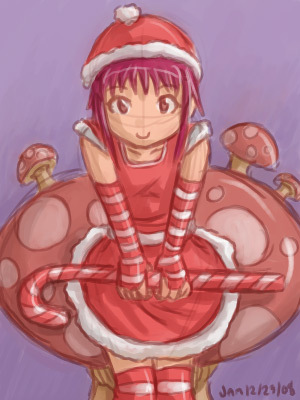 The chocolate for December 2nd had Santa on it, but I didn't want to draw Santa. 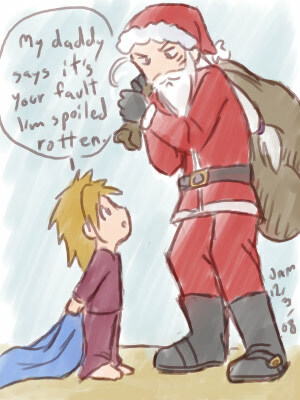 So I decided to dress Prozen as Santa, with some Battle Story irony thanks to kid Wolff. 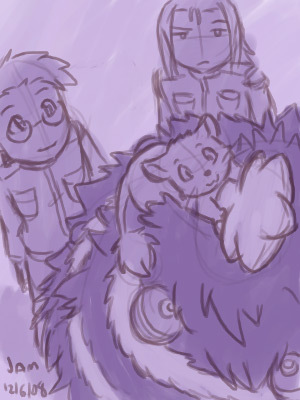 For those who don't know, Wolff is Prozen's son according to the Zoids model Battle Story. 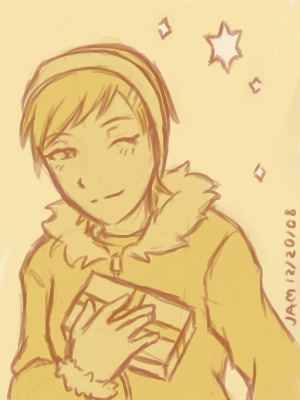 Okay, I know technically I did this on December 2nd, but it was meant for the 1st. 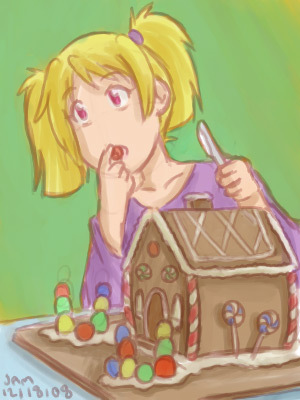 Sammich got me an Advent Calendar for Christmas, and I somehow got the idea to use the chocolates as a sort of theme for something to draw. 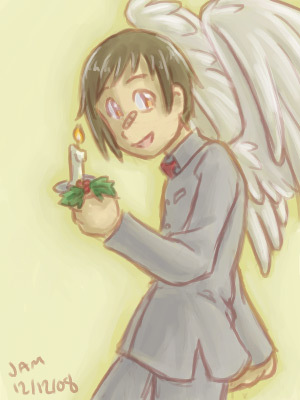 This is one of my angel characters, Michal. 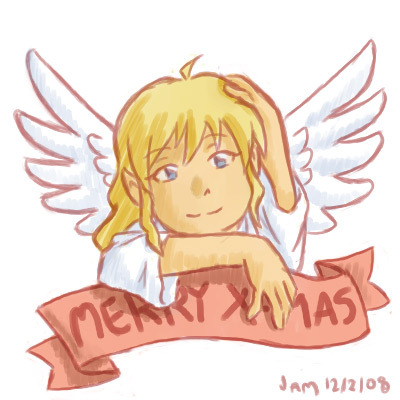 This is kinda what the angel in the chocolate looked like too, but the pose was a bit different. Michal looks kinda lazy. Hehe. 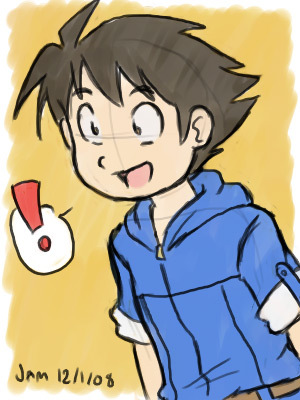 Just a quickie today of Ken Raiga. The main character in the "Zoids Battler Raiga" manga series. 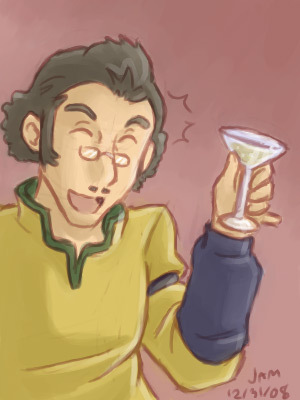 His name is a pun... since he favors Ligers, which romanji-ize to... Raiga. He looks stiff, but really excited here. Maybe he just discovered how much he likes girls? More likely he found a new Zoid model to customize.